Collaborative learning has become an increasingly important part of education, but the research supporting it is distributed across a wide variety of fields including social, cognitive, developmental, and educational psychology, instructional design, the learning sciences, educational technology, socio-cultural studies, and computer-supported collaborative learning. The goal of this book is to integrate theory and research across these diverse fields of study and, thereby, to forward our understanding of collaborative learning and its instructional applications. The book is structured into the following 4 sections: 1) Theoretical Foundations 2) Research Methodologies 3) Instructional Approaches and Issues and 4) Technology. 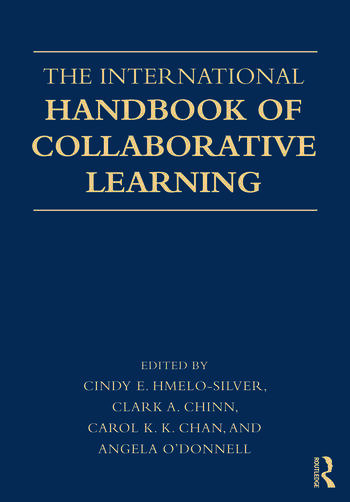 Comprehensive and Global – This is the first book to provide a comprehensive review of the widely scattered research on collaborative learning including the contributions of many international authors. Cross disciplinary – The field of collaborative learning is highly interdisciplinary drawing scholars from psychology, computer science, mathematics education, science education, and educational technology. Within psychology, the book brings together perspectives from cognitive, social, and developmental psychology as well as from the cross-disciplinary field of the learning sciences. Chapter Structure – To ensure consistency across the book, authors have organized their chapters around integrative themes and issues. Each chapter author summarizes the accumulated literature related to their chapter topic and identifies the strengths and weaknesses of the supporting evidence. Strong Methodology – Each chapter within the extensive methodology section describes a specific methodology, its underlying assumptions, and provide examples of its application. This book is appropriate for researchers and graduate level instructors in educational psychology, learning sciences, cognitive psychology, social psychology, computer science, educational technology, teacher education and the academic libraries serving them. It is also appropriate as a graduate level textbook in collaborative learning, computer-supported collaborative learning, cognition and instruction, educational technology, and learning sciences. Cindy E. Hmelo-Silver (Rutgers University) has conducted research on problem-based learning and collaborative knowledge construction. She is co-editor of the Journal of the Learning Sciences and has been active in the Computer-supported Collaborative Learning Community. Clark A. Chinn (Rutgers University) has expertise in argumentation and collaborative reasoning, key aspects of collaborative learning. His research has been recognized by a Division 15 Early Career award, and he edited the Computer Supported Collaborative Learning 2007 Conference Proceedings. He is editor of Educational Psychologist. Carol K.K. Chan (University of Hong Kong) has conducted research on knowledge building and has expertise in assessment in collaborative learning settings. Her work was recognized with the outstanding paper award at CSCL 2005. She is associate editor of the International Journal of Computer-supported Collaborative Learning. Angela O’Donnell (Rutgers University) has done seminal research on cooperative learning and was recently recognized by the AERA Cooperative Learning Special Interest Group as Outstanding Researcher in Cooperative Learning.